I’ve had a bottle of the Breckenridge Vanilla Porter in my fridge for about a week, and though I’d never heard of Breckenridge Brewery before, I bought it because I was intrigued by the name. After reading a review of this beer on “Stuff I Write about Wine”, I decided to move it up to the front of the “beer review” line, since I love dark beer and am a sucker for vanilla. If a food or beverage has vanilla in it, there’s a very good chance that I’ll try it (think creme brulee, rice pudding, vanilla milkshake, vanilla latte, Nilla wafers, a glass of Tuaca liqueur, etc.). Will this brew live up to my expectations? Appearance: Dark brown, practically walnut color. Quarter inch of head that subsides quickly and leaves little to no lacing. Aroma: Dark chocolate. Medium roast coffee. Faint smell of vanilla. Taste: Light carbonation. Mostly bittersweet chocolate palate, with some coffee and a hint of vanilla on the finish. Though I enjoyed the Breckenridge Vanilla Porter, the word “remarkable”, which is quite prominent on the label, has led to some mild disappointment. I was expecting to be overwhelmed by the vanilla, but in reality, I found myself searching for it (I guess I shouldn’t put too much value on a label!). I definitely liked this beer, but I didn’t love it. This is a very easy drinking beer, and with an ABV of 4.7%, having more than one shouldn’t be a problem. I give the Breckenridge Vanilla Porter a B.
You’re right; the vanilla is very subtle; it’s more of a nuance than the whole darn point of the thing. I also agree that the use of “remarkable” on the label is kinda silly (but as a wine chick, I’ve learned to pretty much ignore label descriptors). Though the beer was good, but not “remarkable”, I’m still curious to try your marinated strip steak recipe. Since the beer was just ok, I suppose I could substitute any good porter for the Breckenridge. Smuttynose Robust Porter perhaps? I agree with most of your review, I just thought it was a lackluster porter. Yeah. It was ok, just not very memorable. 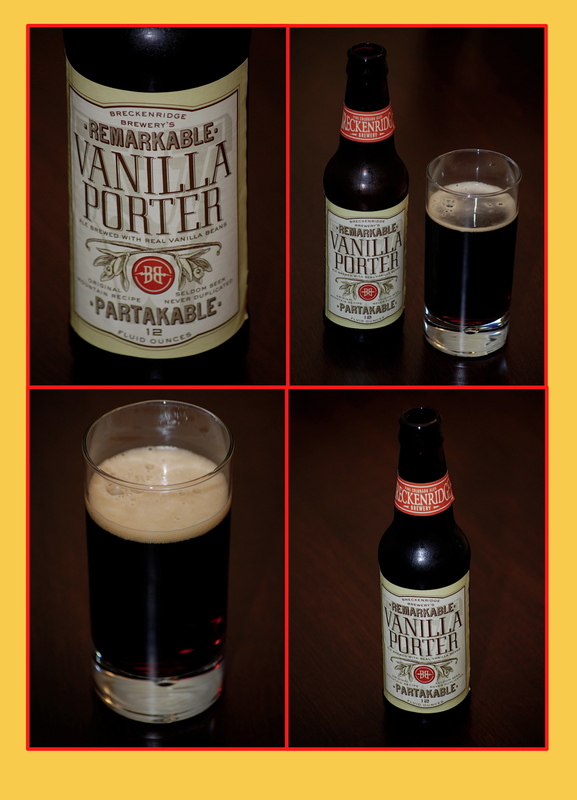 I’m bummed to read your review of the Breckinridge Vanilla Porter – it’s a staple in my fridge and I really enjoy it. Maybe it’s because I haven’t paid too much attention to the label…lol. It was a good beer, just not a great one. I was hoping for more vanilla I guess. I, too, searched for the vanilla and barely found it. Only 4.7%? Wow, it smelled much stronger than that. You got much more head (no pun intended) than I did. It was noticeable mid-pour and I gave the last of it a little bit more of an aggressive pour, but alas, nothing. At the urging of my better half, I tried so this at Eulogy. I can’t complain as I get almost a whole beer when she gets to try a vanilla porter. I have to agree with G-Lo. Remarkable? No. Vanilla flavor? Eh, not so much. However, even though it comes up short on the vanilla flavor, this is a very drinkable porter.